Illegal migrants attempted to cross the border beyond the check points in Lviv region. 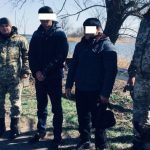 However, local residents noticed the unknown persons in the suburb of the village and informed the border guards of Mostyskyi Detachment. Reaction group started to the place immediately and after locality inspection revealed two foreigners. The men did not have any documents, but introduced as the citizens of Azerbaijan. So far, the offenders are detained and sent to the Temporary Holding Facility. Previously it was established that the foreigners arrived to Ukraine as provided by the law, other details of infringement are established. This entry was posted in Translated Media-News from Ukraine on April 8, 2018 by oksana.